Our 3 cremation packages are offered to help with planning a personalized cremation tribute. They include items client families have found to be meaningful. However, you can totally customize a cremation arrangement to suit your personal preferences or budget. 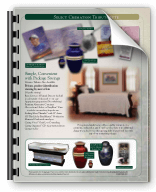 We have a variety of cremation options available in our catalog above (PDF). We welcome you to email info@tributesoflife.com, call or visit us anytime. Prices vary depending on the location selected. Our services are 100% Satisfaction Guaranteed. Kniffen O'Malley Leffler Funeral Home proudly serves Wilkes-Barre, Avoca and the following (but not limited to) communities : Kingston, Forty Fort, Hanover Township, Ashley, Mountain Top, Plains, Duryea, Moosic, Edwardsville, Plymouth and Pittston PA.